An omni-channel approach, with consistency across all channels, is the most efficient, most profitable distribution strategy for airlines. But airlines have to make diligent moves to attain such level of proficiency. Data-driven merchandising and API-led distribution are laying strong foundation for a carrier’s retailing strategy, optimizing performance of both direct and indirect channels. Not only are airlines re-looking at their whole IT infrastructure, but they are also beginning to recognize the significance of a business intelligence layer that can pave the way to regaining control of the offer being made via the indirect channel. Essentially this means airlines need to delve into search and booking data contained in XML message streams. By doing so, one can understand customer groupings in terms of customer type, degree of engagement, revenue contribution and the ancillary upselling-purchasing opportunities, says Jonathan Boffey, SVP for Business Development, Triometric. Analytics is paving way for effective retailing. Where do airlines need to improve in order to be in control? Jonathan Boffey: Airlines, like any e-commerce brand, are earnestly trying to garner differentiated competitive advantage in today’s era of personalised retailing. Customer insight is of paramount importance as it offers the ability to engage with context. A prospective traveller might search directly on airline.com, complete a transaction within Google’s domain, an OTA platform etc. The challenge is getting the right offer to the traveller at the right time and through the channel they prefer. Consistency and personalisation is key. And with NDC, if a carrier isn’t analysing then it’s a missed opportunity, right? Without NDC, airlines have no visibility into search traffic and therefore into how they are performing nor can they sell the same range of value ancillaries at the same time as the seat sale. NDC is all about bringing control back to airlines in terms of offers they are able to make via this channel. Therefore, this channel’s performance should be able to be analysed and scrutinised with an analytical lens in the same way as the direct channel. So what needs to be done to sharpen overall merchandising strategy? Jonathan Boffey: Travel brands need to engage customers using decisions formulated from customer contact and transaction data. Increasingly airlines are counting on XML to deliver content rich offers to OTAs, aggregators etc. What needs to be added to this new way of merchandising is a business intelligence layer. Essentially this means airlines need to delve into search and booking data featuring in XML message streams exchanged between airline systems and travel agencies. The key is to act on this in near real-time. One of the biggest assets that airlines’ today possess is the offer they make. Analysing data flow can shape up the offers they intend to make, and this would in turn differentiate their proposition in the indirect environment. We are equipped to capture the data, offer storage and processing capabilities, plus a web-based interface and reports and charts. All this can be scaled up, too. As a BI and performance monitoring platform, the Triometric Analyzer can be deployed as part of an organization’s data centre capabilities or via a preferred merchandising and distribution platform provider. What does shopping data feature? How can airlines build on their resources with such insights? - What’s the booking curve? How can airlines bring about change – being in control of their IT, offers they make, content they show, distribution etc.? Is the current landscape that features tightly integrated processes too rigid to crack easily? Ai’s Ritesh Gupta spoke to PASS Consulting’s Strauss about the same. Airlines are keenly looking at emerging options, be it for their IT infrastructure or indirect distribution. Two aspects clearly stand out as of today – the pace of change and the quest of being in control. As witnessed, there are new arrangements that are emerging. For instance, Siemens, together with Lufthansa, started using a bespoke Direct Connect Solution for Lufthansa Group in August. The new arrangement uses Amadeus Altea and Amadeus- owned Cytric OBT, with GDS being bypassed. Considering that Amadeus and Sabre are deeply entrenched in this space, what can one expect in the future? Ai: Where do airlines, cumulatively as an industry, stand today in their quest of being in control of their inventory, distribution and sales? Michael Strauss: Nowhere! With the exception of a few airlines, most of them are at the mercy of their PSS or CRS provider. With a couple of mergers (American Airlines or AA and US Airways or Continental and United Airlines) we have seen what an undertaking it is to change the inventory provider (or even merge them) – a multi-year project costing a fortune. So inventory management systems are definitely in the driver seat. Airlines are smart if they at least put sales and distribution in other baskets – which most of them do with their own website or direct connects with large sales organizations (e.g. Priceline) or corporations (Siemens). But considering dependencies, we were able to witness how hard it is to change the landscape: AA in my eyes totally failed with their initiative a few years ago and only a few island solutions remain, and Lufthansa’s success remains to be seen - and it was only possible for them to get this far due to their domestic power. In sales sector business is underestimated – the TMCs maybe do not issue the majority of tickets, but bring in the most revenue. And this is a tightly integrated sector where things collapse if you try to change a screw. 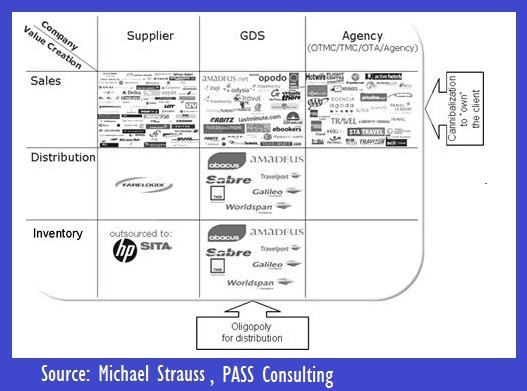 I believe TMCs have put too many eggs in GDS baskets and with the constellation that most inventory management systems are owned by GDSs this makes for a dangerous combination: GDSs control the whole value creation chain (image below) not just with their own sales organizations, but also with their influence on TMCs. So all this friction makes sense to break some rules, but to use a hammer like Lufthansa did might not work for everybody. Ai: Talking of direct connect strategy, how successful airlines are in their endeavour of being in control and also offering corporate travellers a service tailored to their individual needs? Michael Strauss: It is lacking, there are so many tightly integrated processes that I’m not surprised. I still believe the strategy is not to change it all, but rather to make organizations think that they need to reinvent themselves. Technology may certainly help with providing individual needs, but even for us at PASS - we have all GDS integrations and a Lufthansa integration - it wouldn’t make sense to do the same for 480 airlines. So while technology can enable certain disruption to make people think it cannot change the whole landscape and all these players are in there for a reason – it is just that too many players are trying to prevent the status quo and block innovation. But as long as the majority of all the inventory is controlled by Amadeus Altea or SabreSonic there will only be change to a certain degree. It would have been interesting if Google used ITA’s res initiative to provide an alternative res system – but then you would put yourself into Google’s hands which isn’t much better. Different story when it was still ITA software. Ai: It is pointed out that ancillary or bundled products are not readily available when shopping through most travel agencies or corporate booking tools – creating an unnecessary discrepancy and lost opportunity for the airline. What do you make of the situation? Michael Strauss: Personally I’m annoyed by this topic – and also considering it a ‘lost opportunity’ which I believe means lost revenue – there is not lost revenue. People are ready to pay an amount for their trip and if it is too much and there is no alternative they don’t go. What changed? Checked bags cost extra – in the past it was included. It was considered unbundling, but if it was unbundling, the ticket price should have dropped and since so many travellers started to pack lighter and don’t check bags the airlines should have actually lost revenue – but they didn’t. So checked bags is nothing else than a hidden price increase. And so is seat assignment, etc. But this is just beside the fact. What I’m really annoyed at is that we are keeping ourselves so busy with technology and discussion on which channel gets what and so on, and no one looks at the user experience at all. The shopping and booking process is more complicated than it ever was. No matter where I book I always get a price which isn’t tailored for me - no system gets smarter with my preferences and search habits. I cannot really shop with my preferences. Don’t even bother showing me results on a middle seat, a connection at an airport which I don’t like, an angled business class seat, fares with outrageous rebooking fees, codeshare flights which don’t even allow me to book a seat, fares which do not satisfy my mileage expectation, etc. - all we can search today is basic price and/or schedule - and this is just made more complicated for the user as now he has to pay extra for a seat, for luggage, etc. on one airline which he doesn’t due to his status, policy or other things on another one – this is not even possible within the alliances. There is so much more we could do if we all just stopped the fighting and start innovating. As per my chatbot blog: I want a fair offer at a fair price for what I need including my preferences and this shouldn’t come in 20 steps, it should be right at your fingertips. (In his post on chatbot, Strauss refers to utility of a chatbot. One could possibly request for a change in a travel plan, and how right from knowing the PNR to details of the whole itinerary, chatbots could possibly help with not only mundane work but also proactive decision-making say intelligence related to destination you are going to). Ai: Airlines need to work on a standardized API that would be consumed by all channels – web site, kiosk, GDSs, mobile, etc. Even as airlines are trying to be in control of distribution, even IATA points out that API XML connectivity of certain airlines is being done in a proprietary way. Where do airlines need to improve to ensure all stakeholders in the travel distribution chain benefit as well? Michael Strauss: Indeed the problem is one standard. We have gone through this in the year 2000 when we were part of the Open Travel Alliance and were in the process of developing a Multi-GDS interface. The problem with standardization organizations is that there are numerous interests which end up in endless discussion without any result. In 2000, we had deadlines and needed to deliver. We couldn’t wait any longer until everybody was in agreement that why we just developed our own schema back then and left OTA aside. Later our schema somehow became the standard – at least for air. A decade later our schema was introduced by IATA as NDC. But now the same problem happens again: everybody wants to add his own preference and all of a sudden an air shopping message becomes so huge, that it cannot be easily handled anymore. Thus developer refrain from using it. In order to become successful as an industry compromises are important – even if it means that not all of your preferences are reflected. You also need to be fast if a demand for a certain feature is there to get it standardized. On the other hand something which was developed need to remain stable and unchanged for a good while. We haven’t changed our schema in 5 years until recently when we introduced ancillary and our clients love us for that because they don’t have to change anything on their end all the time. Of course, we have still made progress and introduced new optional fields/ features but nothing that required change for our regular clients. In less time IATA introduced NDC and overhauled it completely several times. This makes it very complicated for people to trust that their investment is safe and has future if you constantly have to change and adapt. Some airlines can’t wait or don’t want to wait and they move ahead. It is hard enough for them to get their internal folks behind an idea, so they just skip the idea of a combined industry approach. It is not the best, but it is the nature of standardization. Mobile GSM probably was one of the single most successful standards ever created by mankind, but it was very late adapted in the US. So there is not ideal solution here, bottom line is you need to work with what is out there and see if a compromise is possible. Once a standard or pseudo-standard has been established, you need to remain it constant for a significant amount of time (target 5 years). We are not in consumer electronics here, we are talking about big, heavy systems that need adjustments. Not to forget ever rising security demands which add another dimension of complexity. Ai: In the context of recent developments such as Siemens and Volkswagen now deciding to book flights directly via LHG airlines’ platform, how the distribution status quo is being challenged? Michael Strauss: It is not for everybody and it appears it wasn’t easy and took over a year to complete. It was politically strange that Amadeus Cytric bypasses Amadeus GDS to hook into Amadeus Altea. TMC involvement (created booking can be accessed by the TMC) turned out to be a huge challenge – so yes, there is some flexibility there, but in the long run I still believe at some point GDSs will catch up with more flexibility, new heads will revoke existing decisions and enter into new contracts and we will be back to the old environment just with a little more airline flexibility. Ai: How are TMCs getting affected with the decision to look beyond GDS distribution? Michael Strauss: TMCs definitely have their values and are much needed but with their dedication to GDS mainly due to the overwrites coming in from GDSs this is dangerous game that if airlines decide to bypass the chain as they are unable to change the rules with any of the player, TMCs might be degraded to value added services (Security, complicated bookings, remote areas, etc.) but much less the brick and mortar stuff which in the past have paid the bills. See next question about that TMCs need to reinvent themselves. Ai: Going forward, how do you expect initiatives from airlines to change the world of corporate travel management? Michael Strauss: I don’t see huge change, eventually all will stay the same – once the airlines are happy to have a little more influence to distribution and be able to position their product correctly. There will probably be some island direct connects but only in isolated areas - such as domestic Germany between huge players there. Even in Germany the prosperity of Germany is not built on Siemens, Lufthansa or Volkswagen, it is SME and no solution is anywhere near for SME. It is also interesting to note that LH only transports 4% passengers of compared to Deutsche Bahn. It is a good threat the airlines have against the oligopoly of the GDSs and for that reason they will keep this initiative alive, but in the end there will be arrangements. Way more interesting to me is what TMCs will do, because they should really reinvent themselves and be more than just a call center using technology from everybody else. Otherwise I can see a shift that corporations will bring the technology and expertise inhouse and drastically reduce their agents. I see this happening with one of our financial clients. Don’t forget that soon there will be pretty smart AI agents. Where is industry headed with developments such as NDC? Hear from senior industry executives at the upcoming 7th Mega Event Worldwide 2016, The Event for Loyalty, Ancillary & Merchandising & Co-Brands, to be held in Toronto, Canada. (25 -26 October, 2016). Travel isn’t a frequent buy. So if loyalty is largely equated with how much one spends, then should the “frequency” factor limit the prowess of an airline brand to become a part of a consumer’s lifestyle? As we have witnessed, be it for airlines or even an iconic brand like Starbucks, companies are rewarding best customers based on monetary value spend - meaning that customers who spend more – should be rewarded more than customers who spend less. Now in case of an airline, if one travel twice in a year vis-à-vis a traveller who travels probably 5 times a month, then shouldn’t both be targeted? The frequency of flying or even heftier spend shouldn’t be a deterrent in having a constant dialogue with the so-called infrequent traveller. Simply because we are living in the mobile era, where we have wallets, apps etc. So an airline brand needs to be a part of consumer’s digital lifestyle. A consumer could be spending on grocery or buying seat on an aircraft, but they are getting used to accumulating points for every penny. So when we talk of engagement and a loyalty program that rewards you for everyday purchases, it boils down to how proficient are airlines at being part of their members’ daily activities say social interactions, tracking behavior with partners (retail, petrol, finance etc.)? We also see mobile shopping wallets being opened several times in a day. There is clearly an avenue for travel brands to refine their own digital assets or even be a part of 3rd party ecosystem, which could be a mix of content, information, media, shopping, travel, finance etc. The idea is to be a part of consumer’s lifestyle in a seamless manner. Everyday purchases points earning opens up the utility of a loyalty program to the infrequent traveller, says Nik Laming, General Manager - Loyalty at Cebu Air Pacific Air. “Expanding the potential and the velocity of earning means more travellers can participate and get a real benefit from a program. Most retail and financial card earn options are already spend based so are a natural fit with spend based airline points,” he says. So how to break the shackles of travel not being a regular buy and rather becoming a consumer’s lifestyle? A coalition program of organisations with differing purchase cycles, margins and customer emotional attachment can be very powerful, asserts Laming. Laming explained by referring to peculiar behavior associated with different product categories/ sectors. “Supermarkets see customers often and have large spends but skinny margins. Mobile phone networks see handset transactions but rarely know the customer behind the number. Airlines have very high emotional attachment for people but a small share of spend and infrequent transactions,” said Laming, as he also spoke about insurance companies and credit credit companies in the same vein.“Bringing all these organisations together into a coalition program enables the different business to fill in the gaps.” According to him, the key lies in regular, positive communication with identified and profiled customers emotionally attached to the program, delivering attractive and relatively high value rewards. Every participant benefits as the focus is on solving each organisation’s marketing shortfalls. “Airlines have the most compelling reward and as such tend to be a good leader for such programs,” highlighted Laming. Travel, as an infrequent category, has its share of lure, too, as there is aspirational value associated with flying. “Flights are the most attractive and highly perceived value rewards,” he says. “Programs that offer flight rewards pull harder. Seats are perishable and subject to distress giving opportunities to deliver the most desirable reward at marginal true cost,” says Laming. The option to be rewarded from everyday purchases has opened up the realms of the FFP to the average or infrequent traveller. “Having a network of partners funding the program helps the airline, as program owner, to offset costs and even generate revenues. This dynamic has enabled LCC’s to offer rewards as part of their proposition and has resulted in a new breed of loyalty program,” added Laming. · Targeting the infrequent traveller: The reason a coalition model appeals to infrequent travellers is simple - share of wallet. A person will spend a small proportion of their disposable income on air travel in a year. Adding credit card, supermarket, department store, petrol and other retailers massively expands the share of disposable income going through the program. With higher total spend within the program ecosystem more points are earned and so even the most infrequent traveller can attain those reward flights. · Selecting partners: Selecting and nurturing the right partnership is critical. Bank and financial card partners have always awarded miles for everyday purchases. The extension of the concept to supermarkets and other retailers is a natural one for those programs aiming to appeal to a broader audience. “But it is not for all as some programs are designed to retain and reward only frequent fliers. In this model there is less need for more partners as the vast majority of points will come from flying and natural partners to accelerate earn are the credit cards which are prevalent amongst this audience,” said Laming. · Capitalizing on data: Another critical aspect of a coalition program is to ensure that airlines go through all aspects of data points of the customer journey. As much as airlines can capture the flying data, there are still going to be elements of daily purchases such as co-brand cards/ financial partners/ petrol partners/online retailers partners that loyalty specialists need to capture and able to capitalize on for monetization and superlative member experience. Airlines aren’t analyzing their chargeback data sufficiently or efficiently. There is a need to make the most of multi-layer fraud management. Clean fraud, friendly fraud, fast fraud, criminal fraud, merchant fraud…the list seems to be an endless one. Airlines can’t ignore the malice of fraud, and so much so that chargeback management needs a continuous scrutiny. There is a need to analyse data and monitor chargeback sources to identify trends and triggers; recover losses whenever possible. It is important for airlines to understand whether they are analysing their chargebacks enough. “Chargebacks indicate a mistake has taken place somewhere—whether that is a fraud filter that didn’t detect criminal activity, a policy that is unnecessarily restrictive, or a consumer acted unethically,” says Chargebacks911’s COO, Monica Eaton-Cardone. “Bottom line: Airlines aren’t analyzing their chargeback data sufficiently or efficiently. However, simply mandating more analysis isn’t the answer. Professional insight is needed to improve the efficacy and streamline resources,” she asserted. And if this isn’t addressed properly, problems only compound. For instance, accounting for chargebacks is dreadful. If a chargeback has been filed, the damage to your accounting has already been done. Also, the process is a prolonged one. As Chargeback911 highlights, each chargeback comes with a fee. That means you’ll have to document not one, but two transactions in your accounting software! Ai: The commerce industry has seen dramatic changes in how payments are handled. Can you explain how the problem of chargebacks has evolved? Monica Eaton-Cardone: The groundwork for chargebacks was first laid with the U.S’s Truth in Lending Act of 1968—long before the invention of the Internet. The federal government began to provide consumer protection against fraud liability. Chargebacks were a brick-and-mortar protection mechanism, and back then, there were only two sources of chargebacks—criminal fraud and merchant error. Cardholders were incentivized to use payment cards because they wouldn’t be liable if a criminal made purchases with a counterfeit card or the merchant accidentally processed a transaction twice. Merchants were rightfully held responsible for providing a safe and secure purchasing experience—until the Internet came along. Seemingly overnight, the chargeback system became archaic, unable to handle modern payment processes. All of a sudden, there was a new and illegitimate way to use chargebacks. Consumers learned about the loopholes and identified ways to cheat the system. Despite this new consumer behavior, merchants are—like they always have been—the bearer of all responsibility. What’s worse is more and more policies and technologies are sought out to protect the cardholder while less and less is being done to alleviate merchant’s friendly fraud liability. Ai: What do you recommend when it comes to understanding what is causing chargebacks? How can you airlines become smarter and learn from their mistakes? Monica Eaton-Cardone: It’s only possible to learn from our mistakes if we can identify mistakes for what they are. An inability to detect issues can limit the effectiveness of an in-house team. An outside perspective, however, is often more objective and filled with constructive criticism that will produce greater results. (Points in favour of in-house - can be cost-efficient since there isn’t an incremental cost per transaction, in-house teams come to recognize fraud and chargeback patterns and can adjust pre-emptively. For example, fraud associated with Black Friday is predictable; product knowledge etc.). Airlines need to carefully analyze the effectiveness of their in-house teams and be open to the idea that outsourcing might have greater return on investment. Fraud threats are constantly changing. As fraud detection technology evolves, criminals alter their tactics—what worked for them yesterday might not work today. When it comes to fraud and chargeback management, agility is one of the most valuable characteristics. Unfortunately, most in-house teams are unable to be as dynamic as they’d like to be. In-house experts might know every nuance of their own business and even be aware of trends in their industry; however, a chargeback expert is aware of trends in all industries and how those tactics are affecting payment processing across the board. Ai: Can you talk about the latest developments in the arena of fraud filter technology? How has it helped in dealing with issues and where does it tend to fall short? Monica Eaton-Cardone: Fraud filter technology has made great strides in recent years. Machine learning, as opposed to static rule sets, helps decrease unauthorized transactions while also reducing the risk of false positives. Merchants are tempted to trust fraud filters implicitly and take their results at face value. While technology can help streamline efficiencies, they can’t fully replace human analysis. Manual reviews still play an integral part in effective fraud detection and chargeback prevention. Ai: Chargebacks can also result from merchant fraud and criminal fraud. Going forward, how do airlines need to gear up for all sorts of fraud that can result in chargebacks? Airlines need a carefully constructed fraud mitigation plan that incorporates complimentary tools for comprehensive protection. On the surface, this may seem like an elementary idea, implementation of the concept is quite complex. Airlines need to carefully consider a plan that will address their individual threats. (Airlines also constantly need to understand what sort of fraud is taking place, especially with a number of new ways in which a transaction can be done. For instance, in case of clean fraud, a fraudster manages to impersonate genuine cardholders and tend to commit fraud without raising red flags!). What’s holding back online peer-to-peer transactions? HooYu’s recent Trust in the Digital Age Survey found that 61% of people will refuse to or are unlikely to trust in somebody they don’t know until they are confident in that person’s identity. Before we look specifically at the travel sector and related sharing economy platforms, it needs to be understood that the trust factor also depends upon the nature of the transaction. According to HooYu’s survey, not all sharing activities require the same level of trust in the other participant’s identity. The survey, which featured over 2,000 people in the UK and the US, indicated that sharing activity that required the most identity trust were renting personal items to other people (69% require proof of identity) or renting a room in somebody’s house (68% require proof of identity). Talking of online peer-to-peer transactions such as buying something from an online marketplace or renting a holiday property, it needs to be noted that this segment has grown exponentially in the last five years. eBay, for example, has over 158 million active buyers and 800 million listings worldwide. To date, Airbnb has facilitated 10 million nights of accommodation. And BlaBlaCar motors 40 million passengers and drivers a year. “There has been huge growth but it has to date been delivered by the early adopters and trust and confidence issues are holding back mainstream expansion of the sharing economy,” said David Pope, marketing director at HooYu. As a specialist in this arena, HooYu helps in building trust and security. As an ID checking service, it uses online and social media identity data, ID documents and facial biometric checks to prove that a person is who they say they are. So how should operators that facilitate peer-to-peer transactions look at increasing the credibility of their platforms during the course of the booking? Pope says the first step that sharing economy platforms need to take is to get rid of their caveat emptor approach to the identity of their users. Statements such as “We cannot and do not confirm each member’s identity” or “User verification on the Internet is difficult” are frequently buried in the T&Cs on sharing economy sites. · Some car sharing sites have had to shut down because they have not adequately checked the identities of customers using their car fleet and fraudsters using fake identities have disappeared with cars. · In the ride sharing sector, fraudsters use ride sharing platforms to launder money. A fraudster creates two accounts, one using compromised identity and card details and another with a fake identity that they control. The then pay for a rideshare (that never actually took place) and via the rideshare platform move money from the compromised card to another financial instrument that they control. · In the vacation rentals sector, stories abound of fake property owners. They post a property for rent and in their profile on the marketplace add text to say to email them if they don’t respond quickly via the platform’s own messaging system. The unwitting holiday maker who wants to bag that property at that low advertised price follows-up by email and at that point the fraudster has taken the holiday maker Out-Of-Bounds of the safety of the platform. Then they encourage the holiday maker to pay via bank transfer instead of the platform’s payment mechanism. Then the holiday maker has paid for a non-existent booking on that holiday rentals platform. · Offer a well-lit marketplace by verifying your sharers, it will return dividends in terms of keeping fraud out and attracting new customers to register and transact. · Don’t just use social sign-in as your verification mechanism. Social sign-in just identifies the customer, it doesn’t verify the customer. Platforms need to examine and cross reference the data that they are receiving. HooYu’s approach to identity uses multiple sources of identity to confirm and corroborate an identity. · Go beyond identity. Identity is just one component of trust. If somebody is using their own identity, then you can more safely assume that they will evidence good behaviours. However, competence and intention are also parts of trust and confidence which must be built through mechanisms such as ratings and reviews. Sharing economy platforms can be global from their very outset so they need to create global identity verification processes. Checking identity databases such as voters’ rolls or credit reference agency data will only work in a handful of countries. Instead platforms need to look at universal identity attributes. Also, a platform needs to understand its demographics’ attitudes to trust and confidence in the context of the peer-to-peer transaction that they are offering. Making innovation and digitalisation an integral part of any corporate’ DNA is a major exercise. Ai’s Ritesh Gupta interacts with Bornemann to know how Lufthansa is setting a prime example of being customer-centric. A minor glitch or an unpleasant moment at the airport can spoil a business trip or a holiday with a family. Travellers intend to be in control, to gain easy access to information as they embark on a journey. Last week I flew from Barcelona to New Delhi via Amsterdam. My flight was booked by my office in the U. S via Delta. So I was forwarded a confirmatory email from Delta. On the day of travel, I also received an email from KLM to check-in. Apparently, the first leg of my travel (Barcelona-Amsterdam) was operated by Transavia. I tried to check-in, but I couldn’t. Also, the KLM site didn’t facilitate my check-in for Amsterdam-New Delhi flight. The point here is if a traveller is clicking on given links, originating from the email, then the task needs to be completed. Also, as I arrived at the Amsterdam Schiphol Airport, the screen didn’t show the gate for the next flight initially. I took few steps and asked the KLM staff available at a particular gate just where I was looking at the screen. She told me “F3”. This gave me ample time to relax, even as the screen didn’t flash the gate for another half-hour. So there are many areas of flying, right from dreaming to planning to booking to physically travelling to sharing the journey, where airlines are looking at facilitating a personalised, simplified experience. I say simplified as at times gaining access to mundane information isn’t easy. As for personalised, airlines are digging deeper to ascertain the profile, travelling pattern etc. of a traveller to drift away from generalised information. Singapore-based Frank Bornemann, Head of Marketing, Loyalty Programs and Provider Management APAC, Lufthansa German Airlines explains how the group is focusing on doing the same. “Passengers tend to be anxious…at times nervous (as we physically travel or even start our journey). So right piece of communication in a timely manner (considering the context, location) can help,” says Bornemann. Here a mobile app can be of immense help, but even then the lack of easy access to free Wi-Fi at certain airports can hinder the plan. In order to combat this, the Lufthansa group is banking on the beacon technology. This way Lufthansa can share details about boarding, departure time and gate number via smartphones. Also, to display information on the luggage carousel number for arriving passengers and expected waiting time. In fact, the group is going beyond routine flow and looking at refining the experience as it strives to drive digitalization with diligence. Bornemann referred to the testing of services at the Munich airport when passengers are within a certain proximity of a location, for instance, an offer for entry into the Business Lounge for €25. Bornemann says this message would be delivered to a flyer present in the vicinity of a lounge. It would be sent if the passenger doesn’t have automatic lounge access through customer status or booking class. Another utility-oriented feature is electronic baggage receipt on the app. So one doesn’t need to roam around for a screen or check among 10 or so carousel for luggage. The service results in knowing the baggage carousel. This service is currently available at several airports in Germany, and Milan, with plans to expand in the future. The organization is currently in the process of rolling out a slew of digital initiatives, with focus on being precise with what to offer to customers, matching the need/ intent, the location etc. It needs to be highlighted the Lufthansa group introduced seven fields of action or its “7 to 1 – Our Way Forward” strategic plan in 2014. Two of the initiatives are - innovation and digitalisation, and customer centricity and quality focus. The group is digitizing the entire air travel chain. A major initiative is the SMILE program, taking a closer look at processes and products more intensively from a customer perspective. The industry is gearing up to stitch up data across channels and combine fragments to create a single identity of a traveller. Today there is talk of probabilistic and deterministic methods of identifying a digital user, but it’s a work in progress. Of course, airlines are assessing their own sources of data and systems to capitalize on the prowess of the company-owned digital assets. Lufthansa, for example, is evaluating how to make the most of its 80 databases available within the organization. “Many of our current database systems do not yet “talk to each other” because they were commissioned a long time ago, based on previously relevant needs,” shared Bornemann. Such first party data obviously can lay a strong foundation for personalisation, but it’s not as straightforward as it seems considering the fact that one has to respect the data protection laws, mentioned Bornemann. As per the German laws, there could be several different levels of permission that need to be approved by users before one can act on a certain set of data to send them other offers or promotions. Bornemann indicated that the organization has aligned its operations over the years to gain a strong foothold in the arena of customer centricity. “Whilst the relevant data is available, we have been working in departmental silos for decades and as a result created systems and databases that are not yet talking to each other. We at LHG have created a central project team on a very high level addressing exactly these issues and making this our priority to underline our brand core “enriching travel experience”,” he said. A lot is happening in the world of ad tech, analytics, ecommerce, mobile technology etc. Bornemann finds all of this “very exciting”, and adds “through digitalization it is possible to address the needs of travellers better than ever”. Today travel marketers are working out ways to make the most of available content and make it an integral part of an organization. For instance, a European carrier is working on plans to set up a virtual content store to personalize information and offers via various in-house communication channels like apps, newsletters, app pop-ups, pre-check-in messages etc. And this will be delivered in the most relevant format. “It is of course very challenging to merge all data points, apply the right algorithms and have the right text and visual components come together to create a seamless flow of information to our customers,” shared an executive. For its part, Lufthansa group is also making steady progress on similar projects, but the team isn’t in a position to comment yet. It is not tough to analyze gaps where airlines tend to struggle when we think from the perspective of a traveller. So which areas of flying tend to disappoint in terms of loyalty – right from planning to travelling? It is still challenging for airlines to act on real-time operational data to improve upon their FFPs. “At the moment it is very challenging but in the future we are going to address exactly this point, which will help us to differentiate us from competitors and enrich our customers journey, which should result is loyalty beyond the classical FFPs,” acknowledged Bornemann. When carriers embrace unreasonable ways of charging a customer for an upgrade or a service, it just results in displeasure. This only upsets us and it should be avoided, recommends Japan Airlines’ Akira Mitsumasu. Is unbundling going to make it hard for a family to sit together in a plane? Will I have to pay for early boarding request with my toddler? Now if an airline is already charging for checked bags, overhead bin space etc., it is unlikely that the pre-boarding policy would allow a family to get into the aircraft first. Those who have paid for such services are likely to find space first for their bags, before anyone takes it including a family with kids. Now this might be a common phenomenon in the U. S. but these issues tend to be seen in a completely different way in Asia, simply for the fact that many travellers could be new to flying. So how to approach unbundling or offering ancillary offerings at large in Asia? “There is no one size fits all solution, especially when we think of how diverse the APAC region is,” says Akira Mitsumasu, VP, Marketing & Strategy, Asia & Oceania Region, Japan Airlines. It’s never easy to know if a given attribute (say, seat selection) is better to be included in a fare family or sold as an ancillary. Depending on your brand, market perception can be a big issue. One important thing Mitsumasu recommends is to make sure that the proposed value and price are easy to understand. Ai: If we were to talk of ancillary products and services, what has really delighted you and annoyed you going by your personal experience? In my opinion, ancillary delights when they deliver value and annoys when they are just fees for something that is unbundled. It is somewhat like taking a regular product and deliberately breaking it to create artificially inferior versions. I do to certain extent agree that there are times when some elements of full service offerings could be taken out and sold separately. But when it goes too far, and this can easily be the case especially in markets where travellers expect a standard product to include a decent level of convenience without having to calculate the costs and decide whether to include or exclude certain elements of service. Ai: So what annoys you? To me, when I ask for a full English breakfast in a 5-star hotel, for example, the last thing I would want is the hassle of ticking item by item what I need and wondering how much that adds up to. Another thing that I find annoying, from a traveller’s perspective, is the “clever” idea of opportunity cost pricing. Why should I pay an extra $20 for an economy class aisle seat just because the flight is not full today, knowing that a week ago a same seat on a fully booked flight did not demand any extra price? Or why should airlines cram their customers together in tight narrow seats and then announce minutes before departure that they can move to comfortable seats at a price? These ideas may appeal to carriers as ways to capture extra revenue, but they could also generate very negative travel experiences to the customer. Again, this is my opinion, and other travellers may feel quite differently. But this diverse attitude towards ancillaries is precisely why customer experience could easily go wrong. Ai: How close is the industry to offering consumers what they are seeking? With big data analytics and better merchandising platforms, today’s technology has opened up many new ways to propose personalised air travel and related offerings through multi-channel and device environment. What is technically possible however is not necessarily always feasible, and I think the industry, which has just started to embrace this, will go through a period of trial and error, during which the more relevant offerings will be adopted and the less-so ones eliminated. Although airlines are getting better at personalizing offerings, this does not necessary mean that they are capable of customizing them. Building up an attractive repertoire of different offerings to different customers may not be technically possible nor financially viable either. Ai: When you hear about average revenue per passenger rising up in the markets like the U. S. or Europe, how do you assess the relevancy of the same in a market like Asia? I think this depends on which part of Asia we are talking about. There are mature markets that behave in ways similar to that of the U.S. and Europe, but there are also new emerging markets that are quite different. Many people in Asia's emerging economies have just started to afford to travel, and many have travelled for their first time on LCCs - the experience of which could shape the perception and expectation these new travellers have towards an airline product. Ai: Can you share your observations where you think merchandising strategy requires a different approach say in regions like North Asia or Southeast Asia? I think there are regional differences such as in terms of consumer needs and sophistication that consequently affect merchandising strategy. In Japan, for example, consumers generally have relatively high demand for quality and would often expect full service. There are, however, also segments that are more willing to sacrifice quality for cheaper prices. In some Southeast Asian countries, the norm is to buy "good enough" products and services, and consumers in such segments would want to save air travel expenses and spend instead on other areas. I would look at both regional differences, as well as intra-regional differences, such as the difference between a price sensitive versus a less price sensitive segment within a region. Ai: Any example which shows blindly following best practices can prove to be a disastrous move as far as air and non-air ancillaries are concerned? Best practices work because they often define well two gaps. Firstly, the goods and services an airline offers that is not always needed and hence can be taken out as a separate value offering. And secondly, the goods and services that are required by its customers, but are not offered by the airline; in other words areas for new value fulfillment. It would be highly risky and potentially disastrous if an airline just blindly follows the ancillary offering of another airline without having first an understanding of its own value gaps and hence feasible opportunities. Understanding the market is crucial, and starting with small steps to test what works and what doesn't would be a good approach. Identifying competence gaps, and finding partners that complement your capability is also important. Ai: What would you term as the next biggest development in the arena of ancillary revenue generation? As ancillaries move from air to non air travel related products, airlines will increasingly need to collaborate with other partners, and be flexible enough to un-bundle and re-bundle their resources. In light of this trend, I think the next biggest development would perhaps be extensive value co-production networks competing against one another. Note: The above remarks are Mitsumasu’s personal views and do not reflect that of Japan Airlines. Airlines are increasingly getting proficient at defining their respective retail strategies, and working out a technology infrastructure that would pave way for merchandising capabilities consistent with their chosen policy. A key decision that every airline has to make is to whether to acquire merchandising technology that they can control and even operate. As it is turning out, airlines are open to running their own merchandising engines, embracing a flexible approach to creating, managing, and modifying offerings as per their discretion. The sort of air and non-air products that are being offered - irrespective of the type of trip - too can be a key factor as the traveller may respond positively to a relevant offer shown by the airline. Now this mandates control over both merchandising initiative and technology so that there is a mechanism by which frequent product/ pricing testing can be enabled. Plus, a merchandising system needs to be linked to internal systems such as CRM, customer profiles and FFP database. Also, carriers acknowledge that managing numerous merchandising processes/ systems across direct and indirect channels is not scalable. If each GDS needs a carrier to execute and support their distinctive procedure/ methodology (say a blend of ATPCO filing and GDS direct filing), then the notion or expectation that airlines will manage their merchandising products and services featuring three-four different ways is a faulty hypothesis, something accepted by both the airlines and GDSs. So in order to know more, Ai’s Ritesh Gupta asked Jim Davidson, CEO, Farelogix asked if he were to relate as a traveller, which areas of flying disappoint him till date - right from planning to travelling (for both as FFP member and even with an airline with which he doesn’t fly frequently)? “I do believe the travel shopping process is an area where there is scope for improvement,” stated Davidson. Airlines are trying to sharpen their distribution technology capabilities. For instance, there are tie-ups in place between airlines and technology providers to facilitate a connection directly to sales partners. This way there is a provision to look into each individual direct interface and offer support in planning and implementation. Commenting on this trend, Davidson said all of this comes back to airlines taking control of the offer in order to offer more choices and differentiate their products. “This is why we see airlines investing, now more than ever, in better, more reliable technology for airline-controlled merchandising, distribution and ecommerce, including direct connect as well as new platforms for merchandising and e-commerce that are adaptable, scalable, and more future-proof in the sense new solutions are PSS and channel agnostic,” he said. There are specialists today that are offering airlines the opportunity to markedly enhance their .com spaces while also creating easier methods to reach and appropriately engage more customers. With NDC-XML, and any other messaging protocol, airlines control the content they send to travel agencies. Travel agencies on their side optimize the information they display—be it airline information or hotel information—to maximize sales. Talking of control, are airlines going to be happy with this equation? Davidson doesn’t think there is a major conflict in this equation; in fact, it represents a more robust value chain and opportunity for all. “The airlines are finally in a position to control and personalize their offer using NDC-aligned XML, and third party intermediaries are able to access this broader, richer content and package it for their customers, be it a corporate booking tool, OTA or travel management company. Everyone stands to benefit from a more dynamic approach to travel retailing,” he said. Airlines are looking at single, standardized set of XML messages to feed their distribution partners. The good news is that new technologies and standards (NDC) make it possible for airlines to deliver richer, more personalized offers across multiple channels, and make it possible for aggregators to more cost-effectively scale their integration efforts. Davidson says this is a major accomplishment and bi-lateral win for the industry. “We are seeing that play out in a number of forms – whether it is OTAs such as Priceline consuming airline direct connects; GDS such as Sabre consuming American Airlines API; or innovative business rewards program such as we see with Air Canada Rewards for Business, which also ties into its XML API,” shared Davidson. “So the opportunity and real life examples are there. Where we’re falling short again goes back to the pace of adoption and innovation in the indirect channels, specifically when it comes to travel agency point of sale solutions and the GDS, where there are still major limitations in terms of point of sale capabilities,” he said. “What’s the point of putting rich, personalized content in a robust API if it will end up being sold using selling system that strips the offer down to a commoditized “everyone looks the same” display?” There is essentially no industry or business that can effectively compete this way. This is where the biggest innovation is needed, else the gap between direct and indirect channels will continue to widen in spite of NDC. Ai is scheduled to conduct a “Complimentary MasterClass with Farelogix - Best Practices in Airline Merchandising & Digital Commerce” next month. The way airlines intend to distribute their product, right from filing of fares to sharing their offerings with intermediaries, has been under scrutiny for a while now. Personalisation and doing away with commoditised way of disseminating information are areas that carriers are keenly looking at. In this context, a section of the industry has questioned the efficacy of ATPCO filing system. For instance, an executive told me the concept of even a personalized price, let alone a set of products and services of which many are dynamically controlled inventory, was never conceived when the ATPCO filing system was set in place. The same executive also questioned the attempt to distribute dynamic airline ancillary products and services. ATPCO’s managing director - Product Strategy and Development, Thomas Gregorson acknowledges that when ATPCO initiated its journey 50 years ago, personalisation was not really a need. “However, since this time as we continue to automate the fare distribution process in the industry ATPCO has enabled much of the personalisation that already exists and will continue to work with the industry to meet all of their needs in this regard,” says Gregorson. To provide some context, ATPCO has for decades enabled the ability for airlines to distribute different content to different entities as well as to offer many different prices and products through the interaction of ATPCO data and prices with the inventory management controls. The organization also allows airlines to offers different prices, services and branded products to the passenger segments (Passenger Type Codes, Accounting Codes, Promotion (Ticket designator) Codes, and Frequent Flyer Tier Status). “We have recently introduced the ability to further segment the services that are offered to the level of an individual based on the airline proprietary Customer Index Score. Even with all of these capabilities we recognize that this may not be enough for the future,” admits Gregorson. A multidisciplinary industry working group has been set up that will look at the next level of dynamic pricing capabilities. This working group will include inventory management and pricing and distribution experts. The goal of this working group is to have the full industry implement globally all the capabilities that are already defined within the product as well to define what enhancements need to be created to support the dynamic pricing needs of the future. Gregorson says, “ATPCO continues to acquire new airlines that use our fare and rule collection and distribution services, the amount of data that goes through this service continues to grow and we have presented our and have received support from the airline industry that supports ATPCO being their infrastructure and central conduit for all distribution (NDC and traditional)”. Some major steps towards this vision is ATPCO’s progress on acquiring airline ancillary content with over 130 airlines using ATPCO to distribute their optional services and us being the industry source for baggage fees. “We have launched an airline profile into production for NDC,” says Gregorson. ATPCO has completed its R&D and now is making progress with the building of a Message Hub that will serve as a cost efficient method for airlines and aggregators to connect to each other in a NDC world, while maintaining all the benefits of the current data distribution services. “In 2016 – we will finalize our technology transformation and build out our message hub and dynamic fare creation capabilities,” says Gregorson. ATPCO currently supports over three million parameters which dictate the control and use of traditional distributed content for the airlines. Gregorson says this level of control continues to grow and take new form with the creation of airline profile. “The methods of control will need to merge as airlines seek a simple and consistent method to control all content regardless how distributed. With this we need to move to build an industry infrastructure that is connected to the message hub and has implemented airline profile in its distribution process,” he says. Gregorson shared that the biggest changes in the fare distribution process with NDC will be the airlines owning or licensing airline controlled offer creation engines. “So instead of raw data being distributed to multiple systems, the process will change where the raw data will be sent to each airline offer engine and the airline offer engines will generate the offers,” he says. The biggest challenges with this transformation is the need to cost effectively support the Internet and consumer needs to shop for airline offers and services, and the need for airlines to obtain content creation engines to be integrated in their offer engines. ATPCO is focused on enabling a method for airlines to distribute raw data and created content to provide the most efficient method to support the industry shopping process, to continue to expand its distribution infrastructure of airline to GDS to be also used for all airline to airline distribution to support their offer engines. “Finally, we are building content creation engines that can be leveraged by all airlines,” he says. Gregorson says the data distribution process that is there today will exist and be extended to include more volume and more frequency. “We have seen over the last 5 years our data base grow by 80% and we expect to see another doubling of the data base within the next year as airlines begin to adopt branded fares. We also see that there is need to have more frequent updates of some of the data,” he says. ATPCO believes the most cost efficient and effective way to maintain airline prices moving forward is through a blend of distribution of raw data, utilization of ATPCO content creation engines and creation of processes that enable airlines with the ability to define dynamically alter their pre-constructed prices. This method of maintaining prices, as Gregorson says, will leverage the airlines huge investments in their advance revenue management systems and ensure that their pricing is rational and optimally being implemented. “ATPCO has focused on reinforcing our infrastructure to provide the airline industry with the most flexible, robust, reliable, and cost effective fare distribution that works today as well as for the years to come,” stated Gregorson.